These pens are made from once-fired .50 caliber BMG (Browning Machine Gun) shell casings. The turning of the pens is relatively straight forward but the assembly was less so and took some figuring out. The Peruvian Walnut (dark brown, left in top photo) has some nice grain to it and I’ve always liked turning this particular species. The Osage Orange has some nice cathedral grain and I cut a faux cannelure groove into it to simulate a real bullet using an AP round that was given to me as a gift. Mechanism: Cross style twist ballpoint mechanism. Finish: The wood was sanded to 400 grit then polished up to 0000 steel wool. A wax & oil finish was then applied. The brass shell casing was sanded to 800 wet & dry, then up through 0000 steel wool, and finally polished with silver polish to a soft luster. Since these are once-fired brass, there are dings & scuffs from the firing, extraction and collecting processes. Status: Sold but similar pens may be available. Click here to inquire. Osage Orange (Maclura pomifera) is one of my best selling woods, and with good reason. It starts out as a bright orange color when freshly cut but mellows to a very nice dark orangy-brown with exposure to light and use. I try to make my pieces from wood that I find and this one is no different. My brothers and I split this tree for bow staves a few years ago and I now use the smaller pieces for turning on my lathe. Mechanism: A classic Parker style nib and reservoir. The finish is 24 carat gold plate with an epoxy coating for a very durable surface that comes with a lifetime guarantee. This fountain pen has a postable insert, which means that the end can be inserted into the cap while you’re writing to keep it in place. There is room for an extra ink reservoir inside, so you don’t have to worry about running out, and it comes with a cleaning tool to flush the mechanism for maintenance. Finish: Sanded to 400 grit, then 00 through 0000 steel wool for an extremely smooth surface. An oil and wax finish was then applied. Status: Sold but a similar pen may be available. Click here to inquire. I chose a piece of cut-off Mpingo that had such a variety of colors and grains, it cried out for a nice-looking pen. Mpingo (Dalbergia melanoxylon) is commonly known as African Blackwood and frequently used in the manufacture of musical instruments due to it’s high density and ability to take a fine finish. While this pen looks like it’s all black, there is actually some swirling grain that shows up as reddish undertones that’s difficult to photograph. You’ll really like the weight of this pen because the wood is very dense, so the pen is heavier than you expect and feels nice in the hand. Mechanism: Cross style in gold with black accents. Finish: Bee’s, carnauba and paraffin wax with mineral oil. Sanded to 0000 steel wool. While this pen looks like it’s been cut from two different blanks, there really was that sharp of a demarcation in the wood. Mpingo is a joy to work with. It’s hard and tools almost like a plastic, and takes a wonderful finish. The nicest parts are the red undertones that you simply can’t see in the photo, especially on the lower barrel where it appears black, but if you bring it out into the sun, you’ll see the red beneath the surface. Beautiful! Mechanism: A Cross style mechanism in gun metal gray. Ipé (Tabebuia chrysantha) is an incredibly dense wood, so dense it sinks in water, and won’t sustain a flame. It’s most common use in the US is for making decks. It’s naturally insect & rot resistant, and a number of famous boardwalks are made from it, like the one in Ocean City New Jersey. It’s density makes it difficult to work, and it quickly dulls your tools. I acquired this particular lot of Ipé from a guy who started building a deck from it and discovered he was allergic to it. He sold me all his decking and was glad to see it gone. Although the wood is a dark brown in color, the saw dust is actually green for some reason. It’s also a pretty good irritant, so, if you don’t wear a mask, you’ll probably be coughing for a couple of days afterwards. 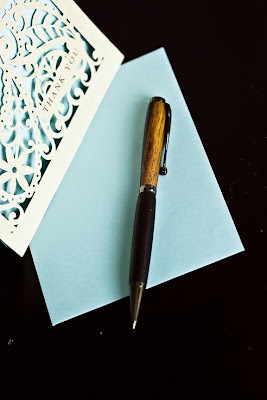 The wood takes a lustrous finish and you’ll like the heaviness of the pen. Mechanism: The mechanism is Cross style and refills are readily available in most office supply stores. Finish: The pen was sanded up to 400 grit, then burnished with 0000 steel wool to bring up a smooth surface. It was then finished with mineral oil, bee’s & carnauba wax and a final polish with paraffin wax. These two pens were custom ordered for my client to be used as gifts on a trip to Japan. The pens are made from Alder (top), and Ifil (bottom). Alder is technically a hardwood, but is actually very soft and surprisingly difficult to turn in small scale. When turning bowls, it’s a lot of fun because it’s very straight grained and easy to turn, but when turning pens, it likes to split on the brass barrels when it gets thin, making it a pain to deal with. Still worth the trouble as the pen is an elegant piece. Ifil on the other hand is almost schizophrenic, the dark wood you see is hard as rock, and the lighter beige is almost rotten soft. I have to turn the blank down close to it’s final dimension, then soak it in cyanoacrylate (CA) glue to stabilize the punky beige part so it’ll turn more like the harder dark sections. In the end it makes for a beautiful pen, and the two-tone look is very striking. My brother gave me the Ifil which is a South East Asian wood as far as I know. I have not been able to find more information about this wood. The Alder (alnus rubr) is from a fallen tree on a friend’s property in Sultan, here in Washington State. Mechanisms: Both are Cross style mechanisms, made from Slimline pen kits. Finish: The Alder pen was finished with mineral oil, bee’s & carnauba wax. The Ifil pen was finished with a mixture of turpentine, shellac, bee’s & carnauba waxes and mineral oil. This pen is made from Mpingo (Dalbergia melanoxylon) commonly known as African Blackwood. Turning this particular pen was fun because it was the first time I’d made anything from it. I was pleased to learn how easy it was to work, and how nice a finish it took. Although the pen looks like it’s all black, there are reddish undertones that just don’t seem to photograph well, but take it into the sun and you’ll be surprised to see that it’s not actually black. Mechanism: Cross style Slimline pen kit. Refills are readily available in most office supply stores. Finish: Sanded to 0000 steel wool, then finished with bee’s, carnauba & paraffin wax with mineral oil. The wood for this pen is laminated Mahogany (which has many different species so it’s hard to tell which one this specifically is) & Ash (Fraxinus excelsior) from the ruin of a broken tiller from our sailboat. The break happened on one of our recent trips and I was dumbfounded because I’d just refinished the entire tiller only a few months before. An examination of the break showed that the Ash had dry rotted while the Mahogany was just fine. Water had intruded into the wood through screw holes for my tiller extension, and my refinishing had only made it worse by sealing the moisture inside. I decided to make a pen from the broken handle, and this is the result. A friend liked it and bought it from me. Mechanism: Cross style, and refills are readily available in most office supply stores. The kit is a slimline. Finish: Bee’s, carnauba, and paraffin wax with mineral oil. Treen are objects made of wood that are designed to be useful, generally in a kitchen but certainly in a household. Examples are bowls, spoons, scoops and other articles that are utilitarian in nature and very pretty to look at. Today, treen has taken on a more prosaic description to include pens & pencils, boxes, letter openers, wine stoppers and other functional items. UNIQUE TREEN is a collection of these wooden treasures. Each treen is handmade from scratch and one-of-a-kind. Crafted for the collector of things unique or that special someone who has everything, they make perfect gifts and create great conversations with their individual back stories. David Gonsalves - I learned woodworking at my father's knee and made various things for fun or gifts as a hobby for years. Tired of the rat race in the high tech industry, the downturns in the surveying & civil engineering fields, and after receiving encouragement from friends & family, I decided to give in to the constant desire to work for myself and started to make & sell treen. I hope you enjoy browsing through my virtual store as much as I do making treen. Please feel free to comment and if you are interested in any of my creations, click on its inquiry link to send me an email. Thank you for coming by!